The study of the left ventricle and the arterial circulation as a “coupled” system is an engineering concept rather than a medical one. It means the study of the energy transfer between a source and the load attached to it, receiving a part of that energy . The ideal coupling is achieved when the maximum of energy is transferred by the source to the load, with minimal waste in friction and heat. In the case of the heart and the systemic circulation, this supposes that a maximum of the energy produced by the left ventricle is converted into forward flow to perfuse the body organs. The best matching between the source and the load, allowing optimal energy transfer, is governed by the mechanical properties of the two units. For example, a battery connected to an electrical circuit as a load will achieve maximum output power when its internal impedance equals the input impedance of the load . 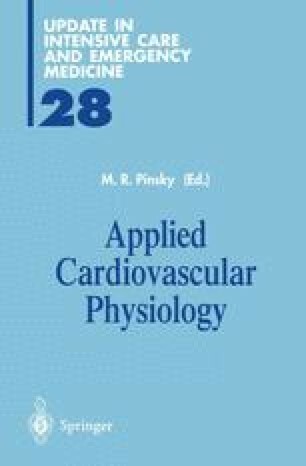 In the cardiovascular system, some insight on ventri-culo-arterial coupling and arterial load properties can be obtained by a detailed analysis of instantaneous pressure-flow relationships [2–4]. Such an analysis allows one to describe the arterial load with the aortic input impedance spectrum, to quantify the hydraulic power “thrown” by the left ventricle into the systemic circulation and the efficiency of the arterial tree in converting these bursts of energy into forward flow to perfuse the body organs. Two examples (treatment of hypertension and septic shock) are presented to illustrate how alterations in arterial mechanical properties influence ventriculo-arterial coupling.